The Basque Educational System Close Up: A, B, D, OR X? Jamie Ryan is a senior, majoring in Global Studies and Spanish. Jamie is planning on getting professional work experience in Chicago and continuing her education in the health care system in the future. She wrote this text as a student enrolled in SPAN 418 ‘Language and Minorities in Europe’ in the spring of 2015. After studying abroad in Bilbao, an industrial city in the Basque Autonomous Community, I learned an interesting aspect of their educational system: children in the Basque Country attend immersion programs that teach them through different language models depending on parental preference. These different kinds of models differentiate the time spent speaking the language at school. Model A is when teaching in done predominantly in Spanish, but there is a required Basque class students must take (Lasagabaster 2001). Model B is teaching in both Basque and Spanish. In the children’s younger years, they are taught in Basque, but more technical subjects, such as math, are typically taught in Spanish (Lasagabaster 2001). The reason for this is that most children speak Spanish at home with the family, and ingraining Basque in conversational language at a young age is more meaningful – it reinforces the language and makes it possible for children to talk with their friends in Basque, which in turn, makes them practice the language and maintain it. Model D is teaching predominantly in Basque with a required Spanish class (Lasagabaster 2001). When I was in Bilbao, I met with a lady twice a week and spoke English with her. Her nephew attended a model D school. While he spoke Spanish at home, he spoke Basque at school. She told me that he would sometimes spell Spanish words wrong, using letters like ‘k’ that would be used in Basque! For a young child, it may seem normal to use a transfer in linguistic features when learning two languages. It seems this child is using Basque and understanding it; he just has not quite fully grasped the differences between the languages when writing and spelling. Spanish is more familiar to him since he speaks it at home, but Basque has been made visible in his language understanding and writing. And finally, Model X, which comprises of “less than 1% of the schooling population,” is teaching only in Spanish, according to Lasagabaster who explains it in his 2001 paper that discusses the different types of schooling in the Basque Autonomous Community and the benefits of the immersion language programs. While this type of schooling is uncommon now, it was the educational norm not very long ago.Despite being an American student studying abroad in Bilbao, I was able to see the language discrepancy between older community members and students. Not initially knowing much about the Basque culture, I asked the 61-year-old lady I lived with for five months if she knew Basque. She answered “no” as if it was not surprising, but I was surprised. I knew that it was a very proud culture, but I was not entirely aware of its history. Basque had a difficult time thriving due to political factors suppressing it. Lasagabaster discusses in his paper reasons why the Basque language declined to begin with. One of the first reasons is that Spain’s Absolute Monarchy encouraged Castilian to be the dominant language, later forbidding minority languages all together (2001). In time, Spanish became significantly more useful than Basque in society. This bilingual education system is a recent adjustment to the Basque culture that was primarily voiced in the Spanish language due to the higher value and common use of the latter in society. Franco’s regime (1939-1975) also had a negative impact on the growth of the Basque language. However, while still under his leadership, “Basque language loyalist groups” created immersion schools, called ikastolak, in the 1960s to revitalize the language (Azurmendi, Larrañaga & Apalategi 2008). Now, how do students really feel about this type of bilingual education? In recent years, the educational system in the autonomous region has changed drastically. 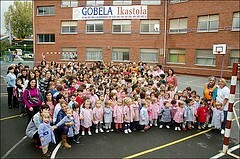 Students are learning Basque while their parents and older generations are not learning nearly as much. Azurmendi, Larrañaga & Apalategi mention that “by age, the youngest are either the most favorable or the most indifferent” (2008). Lasagabaster’s study shows similar findings when the study’s youngest group’s attitudes are significantly more positive than the older groups (2005). This is due to their growing up with the language. As they can speak it well, they are more likely to have positive attitudes towards Basque. However, the policy of letting parents choose where to send their children has significantly altered school enrollment. The percentages of children attending different models have drastically changed between the ages of 3 and 14 between 1983 and 2000. Model A went from about 73% of students to 11%. Model B grew from nearly 11% to 32%. Amazingly, model D grew from almost 17% to 57% of students, according to Lasagabaster’s data form 2001. As children get older, some parents move them to Model A schools “because they are afraid of dealing with a greater cognitive effort in Basque”. Nevertheless, due to the significant enrollment increases, Lasagabaster affirms that a new generation of parents is strongly in favor of the immersion programs. The strong Basque identity contributes to the extent of how people feel about the educational system. In 2003, a study was done in the BAC to ask young people between the ages of 15 and 29 if they “feel Basque,” and 69% of them said yes, according to Azurmendi, Larrañaga & Apalategi (2008). This strong Basque identity is important for this language revitalization – there must be a positive connection between the language and the people’s identity for it to thrive. “Bilingualism, Identity, and Citizenship in the Basque Country.” Bilingualism and Identity:Spanish at the Crossroads with Other Languages. Ch. 2 (2008): 35-62. Web. 28 Mar. 2015. Lasagbaster, David. “Bilingualism, Immersion Programmes and Language Learning in theBasque Country.” Journal of Multilingual and Multicultural Development 22:5 (2001): 401-425. Web. 28 Mar. 2015. Lasagbaster, David. “Attitudes Towards Basque, Spanish and English: An Analysis of the MostInfluential Variables.” Journal of Multilingual and Multicultural Development 26:4 (2005): 296-316. Web. 11 Mar. 2015.